Amateur Radio antenna array. Note the rotator to “aim” the array where required. Pole gauge #3 This array actually blew down in a high wind. It had been mounted on a 7ft x 2in pole (the section between the rotator and the top antenna) but the gauge / wall thickness of the alloy was only 16G/1.6mm rather than the stronger 14G/2.0mm. Even so the thinner wall pole had lasted over two years* thus underlining how strong even the thinner 16G pole is. And don`t forget the thicker 14G / 2.0mm pole is 50% stronger than that ! * Remember the elements on the lower aerial are up to 17ft long ! The top aerial is 10ft long and has a wind loading of 86N at 120km/h (75mph). 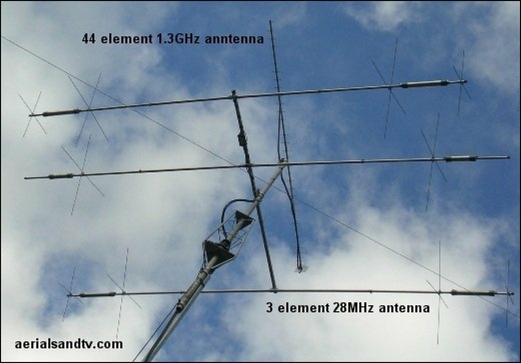 Amateur radio aerial arrays show the differences in element size most clearly as there is such a huge difference in the frequencies used. The top antenna on the array is for transmitting (and receiving) at a frequency of 1.3GHz which has a wavelength of 23 cm. The next one down is an MA5B antenna which has elements up to 17ft long ! It is designed to work at 14 to 28MHz which equates to wavelengths of 10 to 20 metres. It can be seen that as the frequency rises (and the wavelength shortens) the antenna dipole/elements become smaller. By the same token an A group TV (UHF) aerial has a larger dipole and elements than a C/D group, see aerial group element sizes. The transmitter of choice is Emley and the (bottom) unamplified Log 40 gives good pictures on all channels. The XB10A in the middle is amplified and is on Belmont. Depending upon climatic conditions we get poor or almost reasonable results. The fact that it faces East (i.e. toward the Continent) means that in certain weather conditions co-channel interference can be a problem, as it is with many customers in Sheffield who are on Belmont. 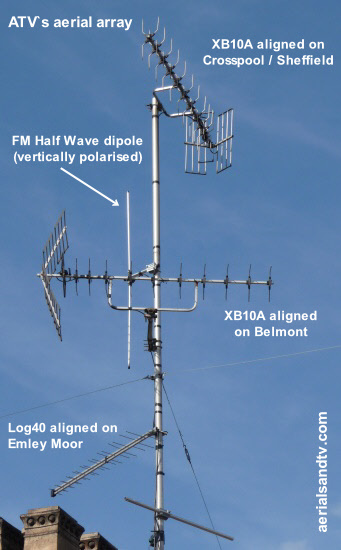 In addition we have an FM dipole vertically polarised so as to work reasonably well on DAB and also pick up omni directionally, see FM/DAB aerials. Pole gauge. When we originally erected the array (above) in July 2000 we just thought a 16ft x 2in pole was a 16ft x 2in pole….. We didn`t know all about the different wall thickness that were available so put a 16G/1.6mm one up. Originally there were no “stays” and we only had one XB10A at the top plus a Yagi18B a few feet up from the brackets, the total free length of the pole was about 13ft. I have to tell you the array did whip about a fair amount in high winds ! Then, in July 2001, the lower XB10A was added and the wind induced movement got even worse.… Even so the unstayed 16G pole still hadn`t failed by Nov 2001 (about 16 months) but we were concerned about it so added the “stays” and this improved things no end. After adding the stays the unsupported length is about 7ft, i.e. no problem at all for a 2in diameter pole, even the thinner 16G type. The point of this little story is to show practically how strong poles are and also that instead of going to all the trouble of adding the stays we could probably have got away with just changing the pole for a thicker 14G/2.0mm one. After all, on our tests at 10ft (= an 8ft 4in unsupported length) a 14G pole was 50% stronger than a 16G item. In a similar vein, a customer of ours installed an 18ft pole using a 10ft x2in pole and an 8ft H/D satellite pole, joining them with a 2in pole coupler. He accidentally put the thinner (16G/1.6mm) 10ft x 2in pole at the bottom rather than the Satellite pole. The install had a big XB16A aerial on it and to be fair it did blow down, but only after 5 years and it took the (almost) hurricane winds we had in that infamous month of Feb 2014 to fail it. I suspect if the 14G/2.0mm pole had been at the bottom it may well have stayed up even in those exceptionally high winds. Note #1 : as we said, the pole failed before the pole coupler (the latter didn`t fail….). Also see Pole Gauge #3. Picture of our shop`s aerial array. When we mended TVs we needed some kind of signal off all the main transmitters around here in case we have to repair a TV for which we have no remote (to retune it) so we didn`t put up this array just out of interest ! Note the way we have used side poles to mount the two horizontally polarised aerials which are aligned on Emley Moor (bottom aerial) and Belmont (middle aerial) respectively. Doing this enables the antennas` cradles to be mounted perpendicular to the dipoles and we found this made a big difference on the Belmont aerial. We have experimented with incorrectly mounted cradles to see how much difference it makes. The difference is actually significant. Full height picture of the array.